Loss, of course, comes in many forms. The pain of loss—of a job, a pet, a friendship or marriage, one’s health, or from the death of a loved one—is unique and yet the same. Within the Service of Solace those who gather will share a time together as testimony that the pain of loss is shared by many and that we who grieve need to be in the company of others who understand. Candles and light play an important role in this Service. The dark of the evening may well express the darkness of loss; the light of the candles, so small in this immense darkness, is an expression of hope and the promise that light will return after the dark night. Readings from different faith traditions will be shared. The readings give expression to the pain of loss and the possibility of healing. As importantly, the readings and responses express hope in the face of loss. Those who attend will be invited, in a time of quiet and meditation, to name their loss—whether old or new, large or small, a single loss or an accumulation of losses—using paper and pen. In the past the naming has included a single word, a paragraph, a poem, simple drawings, or a single mark on the paper. After the naming, a time is given to transform the pain and darkness of the loss into a new light of hope. Music and song will unite those who attend. The songs will unite participants in becoming expressions of hope and peace (even in their grieving). All are welcome to attend the Service. Even those who are not currently experiencing the pain of loss are invited to attend and participate. 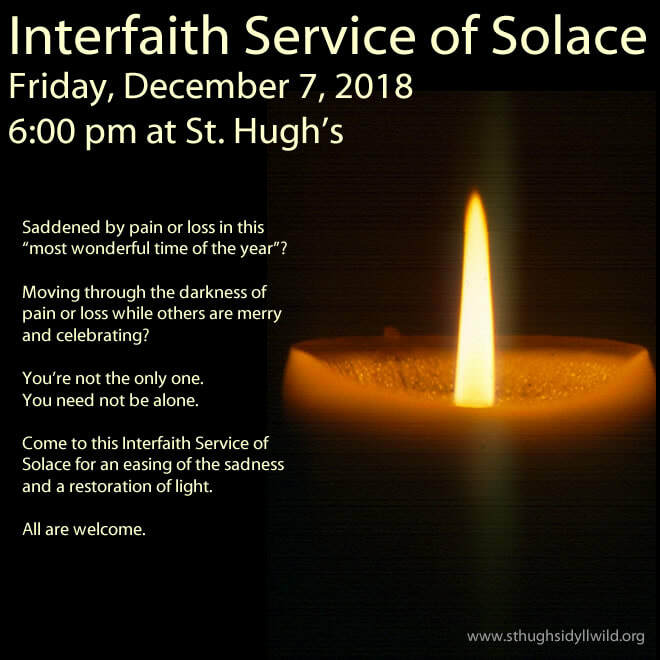 The Service of Solace is offered by the Idyllwild Interfaith Leadership Alliance and is free.